No matter how much the Government complains about pressure from the International Monetary Fund over the issue of raising natural gas rates for residential customers, the Cabinet itself is at fault that the gap between residential and commercial rates has once again nearly doubled over the last few years. So pointing fingers at the country’s lenders only embarrasses the Government and the country as a whole. In October 2016, natural gas for households cost UAH 6.88/cu m and starting at UAH 7.60/cu m for industrial users, depending on the volume used. Today, the household rate is barely higher at UAH 6,96, but commercial customers pay UAH 13.40 as of October 1, 2018, provided that they use at least 50,000 cu m monthly, have no outstanding debts and pay in advance. The rest pay as much as UAH 14.60/cu m.
This kind of gap is not the result of some kind of one-time cataclysm but happened when rates for commercial customers kept creeping slowly upwards as a result of changes in prices on the European gas market while household rates were artificially—and irresponsibly—kept nearly unchanged by the Government. Today’s rate of UAH 6.96/cu m is about half of what it should be if the rate had responded to market factors all along. Instead of rejecting price controls as a way of solving this problem once and for all, and suffer through the inevitable public discontent and political pain, the current Government has chosen the politically and socially more irritating method of “death by the thousand cuts.” Today, it’s clear that, in doing so, those in power have undermined themselves more than anything. Had residential rates shifted according to market conditions by the end of 2016, or at most early 2017, and price controls been removed, more than two years ahead of the elections, Ukrainians would have become used to the new reality and adapted to it. Instead, the Groisman Government dragged out the resolution of this issue until the 2019 election campaign was pretty much in swing, offering a social basis for a comeback by various remnants of Yanukovych’s Party of the Regions. And if it fails to undo this Gordian knot “with one fell blow,” and continues to bring prices to parity with European prices in stages, then fuel rates will probably become the main focus of not just the presidential election, but of the next Verkhovna Rada and local elections, scheduled for 2020, as well. Complaints that Ukraine does not have a competitive domestic gas market may be accurate, but they only confirm the need to bring gas prices in line with the rest of Europe. There isn’t any separate Ukrainian market for petroproducts, grain, metals, ores, oil, sugar, or vegetables, either. Today, all markets are global markets. At most transport costs and logistical aspects might differentiate one regional market from others, but not much more. The Ukrainian segment is just a small component of the global market and so its prices cannot be radically different. Beyond this, if we compare the dynamics of prices for other goods and household incomes in Ukraine since the last time the government raised residential rates for natural gas, it’s clear that the increase necessary to bring rates to market parity does not especially stand out in the overall picture. For instance, fuel has gone up 50-90% in the last 2.5 years. On April 29, 2016, a liter of 95-octane gasoline averaged UAH 21.40, diesel was UAH 18.00 and LPG was UAH 8.05. Today, they are UAH 31.40, UAH 29.10, and UAH 15.00 on average, representing increases of 47%, 62% and 86%. Of course, not everyone needs motor fuel and its share of household budgets, even among drivers, is often less than the cost of heating gas. A similar situation can be seen with food, and food constitutes a far more substantial portion of most household spending than utility payments, as statistics and polls can confirm. Even official statistics show that from April 2016 until August 2018, bread went up 39%, milk went up 40%, meat prices increased 43%, creamery butter jumped 48%, and eggs have increased over 67%. Of course, the general public has been unhappy about all these increases in food prices, but it hasn’t displayed the kind of hysteria that has been observed for years now, over natural gas rates. The best explanation is that food prices have changed under market pressure, not price controls, going gradually up and down with the seasons, although they ultimately end up higher. Meanwhile, the purchasing power of ordinary Ukrainians has also gone up sharply. Since mid-2016, the last time the gas rate was increased by fiat, the rise in wages has been much more noticeable than the price mentioned here. For instance, the average wage increased from May 2016, when it was under UAH 5,000 a month, to UAH 9,170 in August 2018, a difference of 84%, while the minimum wage has gone up 157%, from UAH 1,450 to UAH 3,723, the average pension has gone up nearly 51%, from UAH 1,700 to UAH 2,562. The exception is the minimum pension, which has only gone up 28%, from UAH 1,130 to UAH 1,452. This kind of increase in household incomes in most cases would more than compensate a rise in the residential gas rate if this had happened under market conditions, along with increases in rates for industrial users. Pensioners whose small incomes are growing the most slowly would feel the shift in rates much less if they were given more accessible and more generous subsidies than other population groups. And all this would likely have led to far less focus on the rate hikes themselves. This, of course, would mean an end to price controls and market pricing mechanisms. If the price of bread, dairy, meat, detergent or cigarettes were also subject to price controls, imagine the outrage among ordinary Ukrainians if these prices suddenly jumped because of government fiat, rather than rising gradually under market pressure. Fortunately, this has not been the case. Because the government has had no hand in any of it, these rises have been far easier to adjust to, socio-politically, and have been accepted as a natural phenomenon, rather than leading to the angry response that rate hikes for various utilities bring about. The only alternative is to switch to market-based prices for all fuels and utilities while preventing market monopolists from dictating terms. Nothing else will prevent the politicization of this subject and the social turmoil that sudden, irreversible rate hikes result in. The government needs to shed the burden of controlling energy and utility prices and the responsibility that goes with this. It is more and more obvious that the lack of a predictable gas market and further price controls are key factors that not only keep major European players from entering the market, but also block the expansion of domestic extraction of natural gas in Ukraine by private companies. This, in turn, means that the country loses opportunities to see prices realistically come down by expanding domestic production to cover domestic demand completely and increase competition as new players join the market. This is what happened in the US, where prices were so high that just a decade ago there was talk of delivering Siberian gas through a transcontinental pipeline. Today, the US has turned into one of Russia’s main competitors on the global natural gas market. But for large-scale investment in domestic gas extraction, lack of capital is no longer the problem, but confidence among investors that the rules of the game and rate policy will be stable is. If the next government is run by populists who decide that domestic gas should not be sold based on quotes on European markets but should be subject to price controls based on operating costs, anyone who invests today will find themselves suffering huge losses. The country pays a very high price for this uncertainty: commercial extraction has already been curtailed. The Yatseniuk Government was moving towards consolidated gas rates for all groups of consumers in preparation for switching to entirely market-based rates, and private extraction companies increased capacities 50% in very short order, from 2.8bn cu m in 2013 to 4.2bn cu m in 2016. But after the “final hike” announced by the Groisman Government in April 2016, the gap between residential and industrial customers once again began to expand, speculation about further price controls grew, and so did rumors that the government would nationalize private extracting companies. The result was that in 2017, private companies cut extraction back to 4.1bn cu m, and for January-August 2018, the latest Coal Ministry figures show that extraction is about the same as it was for this period in 2017: 2.9bn cu m. In the meantime, state extraction companies also cut back production. Ukrgazvydobuvannia’s slowing dynamic clearly cannot compensate for the reduction in output at Naftogaz’s subsidiary, Ukrnafta. The result is that 2017-2018 are turning into time lost in terms of expanding domestic natural gas extraction. Meanwhile, the government has failed to introduce effective incentives that would get private domestic extracting companies to reinvest surplus profits into expanding their operations. Given that the savings they entail are not being directed towards increasing production, today’s extremely low fees for extracting natural gas allow private companies to remove their profits from the sector. Currently, domestically extracted gas sells for UAH 9-10/cu m while production costs UAH 2-2.50/cu m, so companies are paying the budget leasing fees for the exploitation of resources that amount to 14-29% of earnings. It’s high time that the size of extraction leasing fees is tied to the pace of expansion going on at a given company: the more the company expands, the lower the leasing fee, and where there is no expansion or production is being cut, the fee should be higher. Those private companies that cannot demonstrate at least 10% growth in extraction annually should be obliged to pay all surplus profits to the state budget by raising the leasing fees on old wells to at least 60%. Even at Ukrgazvydobuvannia, surplus profits are not being properly plowed back into the company to expand operations. Its financial report for H1’18 showed that operating costs were UAH 19.6bn to extract 7.55bn cu m of natural gas and 250,000 tonnes of petroleum with gas condensate. This means the operating cost of 1 cu m of gas extracted by the company is slightly more than UAH 2.20-2.50/cu m. Net profits from selling it at even today’s prices is more than double production cost. The sum mentioned here does not include the investment needed to dynamically expand extraction, say, at least 10% a year. Nor is it coming. Any profits earned are transferred to the state budget in the form of taxes and dividends. The company’s financial reports show that, of UAH 30.47bn in net profits in 2017, Ukrgazvydobuvannia paid UAH 22.85bn went out to its shareholders in the form of “dividends.” But the main shareholder, through Naftogaz Ukrainy, is ultimately the state. Yet only one quarter, UAH 7.6bn, went to other uses, including reinvestment. 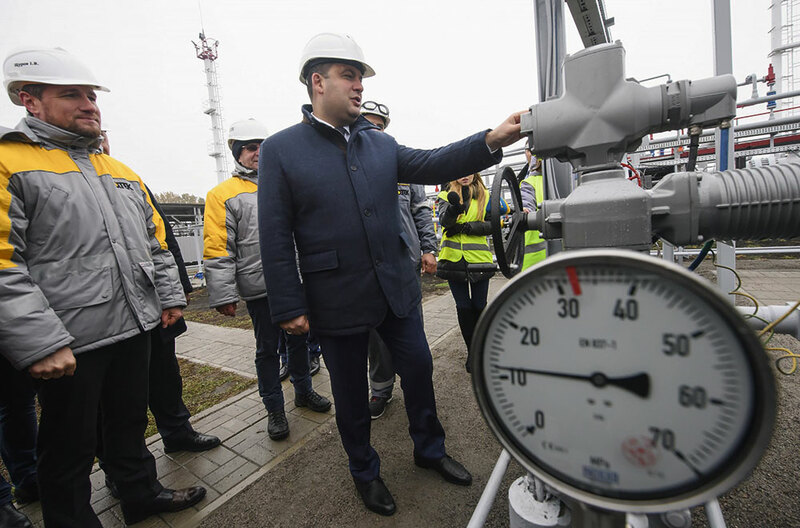 Today, price controls on natural gas are a litmus paper for the lack of independence of the Ukrainian government and its vulnerability to outside pressure, and a quasi-tax being used to fill the revenue side of a troubled state budget. With the mediation of the state budget, they are trying to put together a modified scheme for cross-subsidizing the part of the population that gets subsidies through that part that pays for gas. But this also allows for corrupt earnings by oblast gas companies and co-generation plants that piggyback on such schemes. In 2017, companies in the Naftogaz group paid the budget taxes and dividends worth UAH 107.3bn, more than half of which then went to subsidies. For the first 8 months of 2018, UAH 88.2bn has already been taken in, representing 18.7% of overall Treasury income for this period. So, instead of incentivizing domestic extraction and lower prices for gas by eliminating the need to import it, today’s administratively established yet uncertain rates function as a quasi-tax against all those who pay the full rates for gas and heating. Whatever price is set per cu m of natural gas, be it UAH 7, 8.50 or 10-12, cannot possibly be justified: it is considerably higher than the operation cost of extraction, and both far lower than and, more importantly, unrelated to those that would be established in response to market factors. The main thing is that any price controls were and remain factors that lead to political and social instability without establishing a positive environment for domestic gas extraction to grow dynamically. Under normal market conditions, it would not only grow quickly to cover domestic demand and offer the market conditions for a considerable reduction in rates, but would eventually provide surplus that could be exported. This is something that can happen if Ukraine moves to market-driven rates for gas and other energy resources as soon as possible. Is Gazprom on the Ropes?